“Surely A3 is smaller than A4?” many people ask us. Paper sizes can be a little confusing to the uninitiated, never mind the difference between a ream, a quire and a foolscap(! ), so we have created this simple explanation that will make ordering your printing easier and have you sounding like a pro. The “A” series of paper sizes is recognised globally when describing paper dimensions. It is based on the following: the A0 size (1188mm x 840mm), has an area of 1 square metre with a width-to-height ratio of 1:1.41. The reason for this ratio is so that each size up from this is exactly half the size before it, but always with the same ratio of width to height. 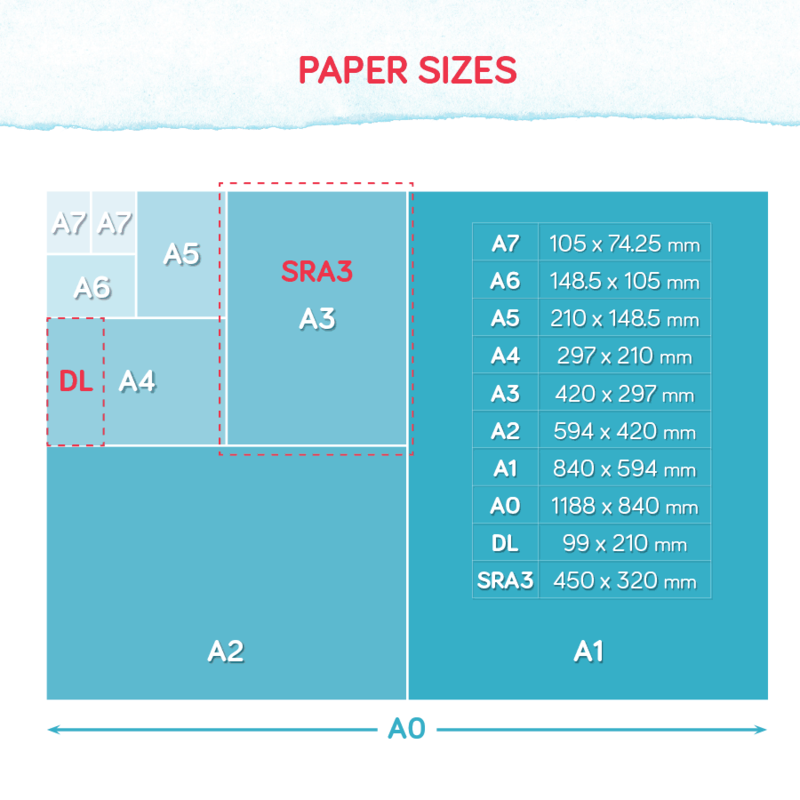 Our handy diagram gives you the dimensions of the most commonly used “A” sizes; where A0 is the largest and A7 is the smallest; but these are not all the sizes: use this online calculator to quickly get the width and height of all “A” paper sizes. At Hot Ink we mostly print on “SRA3” sheets (320mm x 450mm). “Supplementary Raw format A” sizes define untrimmed paper for commercial printing. These are 15% larger than “A” sizes in order to allow for bleed because no printer is capable of printing right to the edge of a page. We impose your print elements together to fit as many as possible on a sheet, so if your item is an irregular size we may not be able to fit as many on – resulting in more sheets of printing required and thus higher costs. We are also able to laser print on even longer sheet sizes (up to 330mm wide by 660mm in length) for book covers, stickers and folding brochures with odd dimensions. However, there are some considerations to be aware of when printing on this size, so chat to your designer to find out what can and can’t be done, or check out out our FAQ’s for more info. #1. Stick to regular sizes as far as possible to maximise cost efficiency. #2. Avoid “US letter” size (often a default size for MS Word docs). As it is 216mm x 279 mm and it can be awkward to match with other standard size elements. It will more than likely be phased out in favour of the “A” series sizing in future. #3. When searching for envelopes to match your standard print sizes, request the corresponding “C” sizes, for example: an A6 invite will fit into a C6 envelope, an A4 requires a C4 envelope, and so on. #4. Did you know that “foolscap” is actually not the same size as A4, but longer and slightly narrower. It gets its name from the watermark of a jesters cap that was applied to this size of paper in the mid-fifteenth century. #5. View our handy guideline for more info on choosing the right grammage and texture of paper for your particular print jobs.